The "Monroe Skyline Trail from Camel's Hump (Couching Lion) south to Middlebury Gap, a distance of over 40 miles" was completed in 1919. "He refused to call his mountain Camel's Hump. To him it was Couching Lion." "Dr. Morse was the founder of the New York Section of the Green Mountain Club, which he organized in 1916." "Fall and winter activities here this year have included hikes on the Long rail and Laraway Mountain, Mount Mansfield on the Maple Ridge Trail to Butler Lodge, and from Brandon Gap to Middlebury Gap. One canoe trip on the Missisquoi River had the group of paddlers in and out of Vermont and into and out of Canada several times. An afternoon walk on the gravel roads on Scrabble Hill in Duxbury in View of Camel's Hump was enjoyed on of those gorgeous autumn days. One out-of-state jaunt was hiking on Colvin Mountain in the Adirondacks. The Montpelier Section cleared and marked a cross-country ski and snowshoe trail in Berlin which it is using regularly on Tuesday nights. No problem of snow. Following Christmas day the snow started falling in Vermont and did so steadily with no variance in the size of the snow flakes nor the spaces between them for three nights and most of three days. For Green Mountain Club Work Day, Saturday May 16 1970, the Montpelier Section will have two work parties, one from French Camp south to Whiteface Mt. and another from Smuggler's Notch to Sterling Pond. Dave Otis is the organizer. 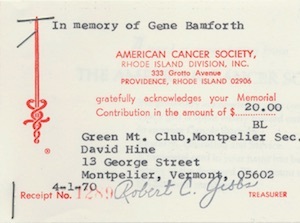 "Eugene F. Bamforth died February 26, 1970 of intestinal cancer. Former Vice-President and Trustee of the Green Mountain Club; Long-time member-at-large, a member of Montpelier Section and an honorary life member of the New York Section; many time End-to-Ender, Adirondack 46er, an early member of the New Hampshire 4000-footer Club, and A-T hiker from Maine to Pennsylvania; and a willing and indefatigable trail worker. Gene Bamforth:- a quiet, shy little man, with a big smile; an institution at annual meetings and intersectionals; a regular consultant on guide book revisions and trail conditions; an incomparable bushwhacker and trail-painter. "Gene was already retired (as a civil engineer?) and a legend when I first heard his name in 1950 and met him in 1951. He was a regular advisor to the New York Section's Vermont Trails Chairman and he outlasted several of us; he always knew the trail and shelter conditions before the crew hit the trail in early June. (How, I don't know; it still amazes me as snow usually limits hiking on the Monroe Skyline until late May.) He once suggested that the Monroe Skyline needed new signs, and then drew up a layout for each of those 180 odd signs indicating location and arrowheads; a job that required hiking almost all of the approximately 50 miles of trail in Vermont maintained by the New York Section. When the signs were produced, he installed them; in most cases he had to return a couple of years later to install a second set of signs because of defects in the manufacturing process for the first set. Over a period of 3 years he painted the blazes on this same set of trails; this effort left the landscape unmarked except for the neatly painted 2 by 6 inch area but he returned to his car with paint all over himself including his eyeglasses. "Gene Bamforth was a solitary hiker in all sorts of weather. I ran into him late one fall on Scragg Mountain on a cold and rainy day; he had bushwhacked up the ridge on the other side while we got moderately wet just hiking up the shorter trail. In later years he usually camped in his car, first a Jeep station wagon, then a V-W microbus. Both vehicles he had personally fixed up with some of the comforts of home including running water and I often found him parked along side of a back road, frequently drying his clothes after a day of bushwhacking or hiking in the rain. Earlier, he must have been a strong backpacker as he covered a lot of terrain; his name occurred at least once in any L.T. logbook that I perused. I believe there isn't a hill in the State of Vermont that he hadn't stood on and there weren't many in New England; he knew all the old logging roads and retired trails, and where the blowdowns were the worst on every prospective trip that I asked him about. "I think one of Gene's favorite areas was the Worcester Mountain Range. The several trails on White Rock, Hunger, and Worcester Mountains were well maintained solely by his efforts. Within the last couple of years, Gene marked a trail across the ridge from Hunger to White Rock which is a very pleasant hike any time of the year. "Gene was a retiring individual who always had a wide and friendly greeting for a friend. He and Roy Buchanan had a humorous discussion after one annual meeting about whose ridge out to get moved away from whose cabin or vice-versa; a subject Gene was somewhat sensitive about since he believed that buildings and landmarks should not be named after living persons. But, in a group, he never seemed to be at ease the way he was with only one or two others. He always attended intersectional but usually hiked alone or with Roy MacDonald. Normally, he scouted the trails near the intersectional area just before its first weekend and anybody who wanted the latest information on trail conditions could get it by asking him. "Gene is gone, his long-continuing efforts on behalf of the Green Mountain Club will be missed by many. This observer already misses him.
" D.M.W [Donald M. Wallace]"
"It does seem looking back over the winter hikes that the snow and temperatures have been just right; from the first moonlight snowshoe hike for a Christmas party at Buchanan Lodge on the Bamforth Ridge Trail up through to a snowshoe hike up the Stowe pinnacle on March 1. During that time there have been seven outings. The annual oyster stew supper was held January 16, at Taylor Lodge on The Long Trail. "For those of us who get out and enjoy the winter hiking, we watch the temperature now wondering if there will be a few more hikes on snowshoes or cross country skis before this particular wonderful season end. Montpelier Section member Cynthia Brady won the Grand Prize in the Anniversary Year photo contest with a colored print of a winter scene on Camel's Hump. There was no Montpelier Section report. "During this summer season this Montpelier Section canoed, camped and hiked in New York State in the Adirondacks areas of Forked Lake and Heart Lake. It hiked in the New Hampshire Mountains on the Percy Peaks and the Carter-Maria Range. There was one Long Trail hike in the northern part of the state on Jay Peak. One hike was scheduled for out of the United States on Owl's Head Mountain in Canada. It was a rainy gloomy day by two hikers showed up at the appointed time and place and they - Doris Washburn and Dorothy Babcock - true dye-hard hikers, traveled the two and one half hours to the mountain and hiked it for a couple of hours. David Otis organized the Montpelier Section's efforts for Green Mountain Club Work Day, Saturday May 15; the Section was assigned Division 10. "The snow fall on the first day of spring this year broke the all time record with the season of 1970-1971 having a greater fall than the previous record which was made in the winter of 1886-1887. (On March 21 the recorded depth at the Gauge at the Weather Bureau in Burlington, Vermont, was 132.2") Due to this there has been plenty of snow and there still is plenty for many good winter snow shoe and ski touring hikes. "This winter this Section has had hikes and 2 cookouts on the Long Trail; steak cookout at Wiley Lodge and an oyster stew supper at Taylor Lodge. The November hike in the Adirondack was changed from a climb up Giant Mountain to a hike along the Ausable River due to the inclement weather. The winter hike scheduled for a ski touring one along the Ausable River was changed to ski touring at the Trapp Family Lodge trails in Stowe, Vermont, also due to the kind of weather. "All winter hikes have been well attended with 10 to 12 persons on each hike. "Our annual meeting in April had about forty members present. Officers elected were President - Sally Sairs, Treasurer - David Hine, Secretary - Charlotte Langer. Our spring trips were spent mostly canoeing, as snow did not leave the upper trails until very late in the season. There trips included one in the Dead Creek area, moderate white water canoeing on the Mad River, and one the Lamoille River, rescheduled form the Winooski River as that became too low and too polluted. "The section aided in Green-Up Day around Montpelier. On May 15, deep snow kept us in the low country, so to speak, as we worked on the section of the Trail south of Bolton Lodge. Several families hiked Scragg Mountain in Northfield, following the older, overgrown trail from the east. A week later, we worked on cleaning up around Sterling Pond Lodge, removing as much of the dumps as could fit in a Scout and its trailer. Work was also done on the Long Trail in that area and on the Elephant's Head Trail. 23 Montpelier Section members attended the Intersectional at Camp Ondawa in Sunderland. "Several members of the club spent the 4th of July camping at Forked Lake in the Adirondacks. Canoeing to their campsites and to other places on the lake provided a welcome change from the traditional noisy celebration of the 4th. A large group of hikers came out for each of the Long Trail trips. In July we hiked from Brandon Gap and, in August, from Vt. 242 over Jay Peak to Vt. 105, the Jay-Richford Highway. "Again in August, we had a supper outing at Crystal Lake in Barton, and climbed nearby Wheeler Mountain., 22 people attended. Later on, a chili supper at Barrows Camp was scheduled and 31 people turned out. These type of outings are specifically planned with moderately short and easy hikes so that families with young children can participate also. "A couple of trips were cancelled because of poor weather conditions. A hike up Mt. Worcester was held in August, and the clear weather at the end of September provided members with a beautiful day for a hike on the Crawford Path in New Hampshire. "We had a good fall season for hiking which shifted suddenly and definitely to snowshoeing and ski touring after the Thanksgiving snowstorm. In October, two sections on the Long Trail were hiked, one in the pouring rain when one of our members finished his last section to become an End-to-Ender. The other was in bright autumn sunshine where members watched hundreds of wild geese flying near or below them as they hiked from Burnt Rock Mountain to Montclair Glen. "Members climbed Camel's Hump, Mount Monadnock in New Hampshire and, during the hunting season, hiked over Hawk Cliff and Indian Head Mountain in the Ausable Lakes area. Two cookouts were held, both well attended. One, an overnighter, was to Taylor Lodge, the other to Beaver Meadows Lodge, into which we snowshoed and skied for a grilled steak dinner. "Hikes have had anywhere from two to sixteen people attending, our short hikes enabling families with young children to come. "This winter holds a variety of ski-touring, snowshoeing and winter mountaineering trips, with the Section's Annual Meeting set for April 7. "Early snow this winter has made for an extra long season on skis and snowshoes. The section held its annual oyster stew in January, which was well attended. About half the group remained overnight in Taylor Lodge and enjoyed an oyster stew breakfast, also. "Other hikes have all been in the central Vermont area to places such as Wiley Lodge, for a beef stew dinner, Mt. Hunger, Camel's Hump and Ranch Camp. Attendance has varied widely with the average being about seven persons per hike. 12 Montpelier Section members attended the GMC Annual Meeting in Weathersfield. Membership counts: Montpelier has 63 adult + 11 junior members. The New York and Burlington Sections each have more than 400 members. "The major accomplishment of this section was the rebuilding of the Sterling Pond Lodge which burned down last spring. Work on the new structure which is a lean-to, was begun during the Intersectional with much appreciated help from other GMC members. Three weekends and many man-hours later we completed the lean-to. A cookout for twenty people was held to celebrate the event. "Hikes this summer and fall have ranged from Giant Mountain in the Adirondacks to Mount Moosilauke in New Hampshire via several outings on the Long Trail. Our annual blueberry hike in the Worcester Range was less productive than usual, but we enjoyed some fine views on a magnificent day. Another Sunday four avid bicyclists covered thirty-two miles in the Hardwick-Craftsbury area. "We have three new End-to-Enders this time: Fred Osborne, Charles and Alan Bristow. Alan completed the Long Trail just before his ninth birthday, and we are all very proud of him. "On Friday, September 1, 1972, the Madonna Mountain Corporation loaded two of their bombardiers with lumber and other building materials purchased by the Green Mountain Club and proceeded up the slopes of Sterling Mountain. Six volunteers of the GMC rode up with them and started transporting the material by hand from the top of the ski lift to the site of construction, which is the same spot where the Sterling Pond Lodge sat. The former lodge was burned to the ground in April 1972 from the result of a gas stove getting out of hand by a group of school boys spending the night there. Sterling Pond is located on the Long Trail about one mile north of Smuggler's Notch. Two volunteers stayed with the materials Friday night to protect it from porkies and other vandals. "On Saturday, eight volunteers from the Intersectional again rode up the mountain on the Spruce Peak maintenance road in two four-wheel drive vehicles. The stone piles were erected and the floor was laid; also, the rest of the lumber was carried to the site. "On Sunday, ten volunteers from the Intersectional again rode up the mountain, one of them being Roy Buchanan. Roy was invited to advise the group because of his previous experience in building GMC shelters. All of the uprights and the back wall were installed, and the lumber used so far was creosoted. All of the burned logs left from the old lodge were cut up for firewood. "Monday found six hardy volunteers again riding up the mountain. They installed the bunks and put on the roofing boards. "On Sunday, September 10th, a group laid the roofing material, closed in the sides, put up the overhang and built a table. "The Montpelier Section of the GMC planned an overnight supper hike to the new shelter September 23rd and 24th to finish the details. A two foot wrap-around was constructed on each side of the open front of the shelter for wind, rain and snow protection. The final creosoting was done. The group enjoyed a hot dog roast and a beautiful full moon. "Hikers are warned that the water supply is very, very poor at the site, and it is suggested that they carry a supply of water if they plan to be in this area." "This section has just come down from Taylor Lodge and the annual oyster stew supper. Twenty-three people showed up to savor that delectable liquid, expertly cooked by David and Anne Otis. Those who made a week-end of it, had two beautify, clear days up in the mountain. A foretaste, we hope, of other winter days to come. "Fall and hiking on bare ground seem a long time away. We did, however, have a busy fall with many hikes in Vermont and a canoe-camping trip to Aziscohos Lake in Maine. Between two and thirteen people took part in these outings. A slide show was presented by Richard and Dorothy Babcock and Doris Washburn on their summer hikes in the Swiss Alps. "Another slide show is scheduled for February with all members contributing. We are further planning a snowshoe hike on Camel's Hump, several moonlight hikes in the Montpelier area, ski-touring over the Middlesex Notch, on the Vasa Trail, and on Burke Mountain - just to mention some of things we are looking forward to. If only the thermometer would hover somewhere between 32° and -10°F . . .
" Reidun D. Nuquist, Reporter"
"This section arranged three popular moonlight hikes in nearby woods and on a golfcourse while the snow still lasted. In all more than twenty people showed up to ski and snowshoe after work hours. This seems to indicate that hikers feel a need to exercise on weekdays, too, not just to make that big push on week-ends. "One of the longest "pushes" we made this winter was on the Vasa Trail. A party of four skied twelve miles from Madonna to Underhill and then some as they missed the right turn. The snowshoers did not push this far, but quite a bit higher, when they climbed Camel's Hump on a cold Sunday in February. Perfect visibility on the summit was their reward. Several short snowshoe and cross-country hikes were scheduled, too, the most popular being a family outing to Beaver Meadow Lodge. "As heavy rainfalls in the middle of March washed away most of the snow in Central Vermont, our last ski touring hike had to be cancelled. Instead, the first canoe trip of the year took place. Four canoes paddled down Dog River into the Winooski to the Middlesex Dam. This was two weeks earlier than last year. "Coming up next on our calendar: a spring planning session and the Annual Meeting of the Montpelier Section. 4 Montpelier Section members attended the GMC Annual Meeting in East Poultney. "This spring the Montpelier Section tried a new kind of outing: a combination canoe and bicycle trip. While canoeists paddled down the White and Lamoille Rivers, other section members biked alongside to watch them slide through the rapids - and sometimes capsize! We liked these combination trips, and are ready to try them again. "A family hike to Cantilever Rock on Mount Mansfield was the biggest turn-out. Eleven children and ten adults scaled the short but steep path to the Rock where they stopped for lunch. Other spring hikes went to Mount Elmore, Middlebury Gap, and Cardigan Mountain, N.H.
"The annual clean-up of Sterling Pond took less effort than usual as it was found to be in relatively good shape. Trail clearing took place in the middle of June. "New officers for the year 1973-74 are: President Charles Bristow; Secretary Reidun Nuquist; Treasurer Richard Babcock; Trustee Sally Sairs. "(P.S. Reidun's report arrived air mail from Oslo, Norway, prior to the "deadline" and that's a record for distance and timing.)" "There is a working stovepipe at Taylor Lodge! David Otis from the Montpelier Section installed a new one in January on the day of our annual oyster stew hike. He also cooked us a generous pot of steaming stew, with the help of his wife Anne. Those of us who found sleeping space in the lodge, spent a dry, warm night indoors. Others who were not so lucky, had a less comfortable time outside in sleeting rain. "Rain and an early thaw forced us to cancel more outings than usual this winter - including a moonlight sliding trip and several snowshoe and cross-country hikes. "In spite of this we did enjoy some fine times with outings to Mt. Moosilauke, N.H., Camel's Hump, Burke Mtn. and Mt. Hunger. A cross-country trip around Charles and Claudia Bristow's home in East Montpelier saw the biggest turn-out when 30 adults and children skied on a sunny afternoon with perfect snow conditions. "Now, that the snow is soon due to disappear for good, we look forward to another white-water canoeing season. (Four foolhardy members were out paddling as early as March 9!) In the meantime, we will be socializing at another slide-show and the annual meeting which is scheduled for April 5. 1 Montpelier Section member attended the GMC Annual Meeting in North Bennington. "We have had a busy spring and early summer. In April, Stephen Young from the Center for Northern Studies at Wolcott gave a most interesting talk about Alaska to the section's Annual Meeting. Later in April there was some good white-water canoeing on the Mad and White Rivers. A few paddlers found an unscheduled dip more than refreshing! A number of family hikes were well attended in May, particularly the corn chowder supper prepared by Sally Sairs at French Camp. Rich Czaplinski entertained the kids by making willow whistles for all. We tooted all the way home! Our best turn out was for breakfast (food always attracts a crowd!) followed by a full day of trail clearing on our section of the Long Trail: Rt. 108 to Sterling Pond Lodge and Elephant's Head Trail. Hikers will find Jon Sairs and furry friend Bert as caretakers at Sterling Pond Lodge this summer. "Lots of folks turned out for the Montpelier Section Annual Blueberry Hike up Mt. Worcester in mid-August. Nineteen of us tromped up the mountain loaded with buckets and visions of blueberry everythings dancing in our heads. A fine day and off we went! Near the top, echoes of "I found some!" and "WOW! Look at these!" filtered down to the slow-but-steadies and hopes were high. Once on top, picking began in earnest. But after a few hours we met for lunch and found that our imaginations were fuller than our buckets. ( few tell-tale blue grins on the younger pickers told part of the store!) So, even if our shelves won't be lined with blueberry preserves this fall, we did have a great day and some tasty muffins or sundaes for our efforts. Next year we'll head up a little later in the season and hope for a better harvest. "An extra note: Congratulations to Dave Otis from Montpelier who completed his Long Trail End-to-End at Intersectional this summer - after lo, these many years! "Our section membership has increased greatly in the past year. In 1973-74 we had 28 adult and nine junior GMC'ers while 1974-75 brought 48 adult and 15 junior members. We've also had a dozen or more inquiries about the GMC from prospective members. We thus hope our ranks will continue to grow this year. "During the past fall and winter we scheduled outings for almost every weekend. Some of the winter trips have been made to the White Mountains by the hearty climbers who prefer rugged winter climbing while others have preferred snowshoeing and ski touring in nearby parks and on the trails which we cut in the Berlin area. Our section seems to have a core group of 6-12 folks who turn out for most of the trips. But we did have 30 or more members participate in some of our family outings and trailwork trips. All day outings plus supper were well attended; food always draws a great crowd. "We spent a good day in June working on our section of the Long Trail, which is the three miles from Vermont Rt. 108 to Chilcoot Pass plus Elephants Head Trail. Sterling Pond Shelter was in good shape but some minor repairs were needed on the outhouse. Later in the summer we had a day of clearing and painting trail blazes up both sides of Mt. Hunger. "As in the past we schedule other activities in addition to hiking and right now we are looking forward to canoeing and biking this spring. "In addition to regular hiking, canoeing and bicycling activities, the Montpelier Section is in the process of relocating several small sections of the trail in the Sterling Pond area to higher ground. We'll also be doing some intensive work on other parts of our stretch of the LT system. This will include placement of waterbars, construction of stone steps and the bridging of some mucky spots. We expect to do this later in the summer in cooperation with the caretaker at Sterling Pond Shelter, Jonathan Sairs. "On Aug. 10 members of the Montpelier Section relocated several hundred yards of its assigned part of the Long Trail. The stretch runs from the top of the Madonna Mountain Ski Area lift to a point near the Sterling Pond Shelter, which the section rebuilt two years ago after it had burned down. "The decision to reroute had been taken a few weeks before, at one of the section's regularly scheduled planning meetings, but had been in the making for several years. The Long Trail receives heavy use (sometimes abuse) in the Mt. Mansfield/Smuggler's Notch area. In this area in particular too many feet had exposed tree roots along the trail, creating an obstacle course for anyone but the very agile, and standing water in places had necessitated new patches of "corduroy paving" each spring. "About a dozen people showed up to help with the relocation of the trail. Leader was Dave Morse, trustworthy and long-time member of the Montpelier Section. The party also included Robert and Wendy Hamilton, Kathy Sharp and Doris Washburn, as well as Trustee Sally Sairs and President Andrew Nuquist. A few hikers also gave a helping hand on their way by. "The new route had already been surveyed and marked with ribbons by John Sairs, son of Sally and caretaker at Sterling Pond, and the work party was able to go right in with shovels, axes, saws and pruning shears. The handsaws went in first, removing the biggest obstacles; then came other tools, in teams or alone, to smooth the trail floor and cur off obstructing branches. After a long morning of hard work the Long Trail had a new location on top of the ridge instead of down the side as before, all neatly denoted by a string of fresh white blazes. "Rumor has it that section member Paul Brodeur showed up just as the weary laborers were ready to sit down to lunch. We will not attempt to find out what kind of reception he received, but we can guess. We hope he responded in kind. "We don't know about other sections, but in Montpelier we celebrate the holidays. Celebrating means a party and party means food, and we must all love to eat because the turn-out is always large when there is something edible thrown in. Our kind of party is usually held in some Godforsaken shelter with three walls so rain and snow can blow right in on the canapes and, of course, you have to hike a few miles across icy and treacherous terrain to get to them. So maybe we aren't just gourmands but masochists as well. Or perhaps that amounts to the same thing in this case. "Our 1975 Christmas party was held on December 13 at Duck Brook Shelter which we usually reserve for the occasion. I, for one, appreciate the fact that there is now a sturdy footbridge across the brook. One year we made a long detour, looking for a ford, but ended up with icy feet all the same. "This year we had to contend only with icy rain and strong wind. The fire we managed to build outside the shelter did not make much difference to the body temperature. However, the carried-in delicacies did. We had homemade cranberry bread, Cabot cheddar, crackers, cheese puffs, popcorn, apples, cookie bars, and hot cider. Mmmh. "A Christmas party is no proper affair without presents, as any child can tell you. We had five children with us. Sally Sairs, trip leader, acted as master of distribution ceremonies when each of us got to reach into the depths of a sleeping bag cover - no looking! - to pull out a small, wrapped present. We "oh'ed" and "ah'ed" as a bright bandana kerchief, a chocolate bar, an everlasting candle, or a packet of Lipton's dried soup was uncovered. "According to tradition, a unison "Jingle Bells" then resounded through the wintery woods. That meant the end of the party and time to return to civilization and central heating for those of us who are masochistic enough to eat out in the cold, but not sleep in it. But four hardy souls chose to stay at Duck Brook until the next day. "Among them was Robert Malvern who at age fifty-plus has taken up winter camping. For him we reserve an additional adjective: heroic. We feel he deserves a medal or, failing that, a cup of hot Lipton's soup. "At our annual meeting April 2, our treasurer, Richard Babcock, noted that the section has a respectable balance for this year, but recommended that dues for next year be raised as the main club has increased its section assessments. The dues were then raised to $5.00 for adults and $2.00 for students aged 12-18 years. It was decided not to retain the children's membership category. "The membership was reported to have gone down to about thirty, and concern was expressed regarding the fact that participation for outings has also decreased, despite a wide variety of scheduled activities and regular news releases. "Following the business meeting the two speakers were introduces. Conrad Motyka, Vermont District Forester based in Morrisville and responsible for the Worcester Range, discussed his work and suggested ways that the Montpelier Section could help with trail clearing and blazing on Mount Hunger. "Larry Van Meter, Executive Director of the GMC, followed with a review of the present activities of the club. He touched on interaction with Vermont state agencies, the trustees' decision not to become part of a national trail system, the ranger and caretaker programs as planned for the summer, and the relationship between the main club and the sections. There was a general feeling that Larry's presentation did much to strengthen this relationship which can sometimes be unclear to those who do not attend the board meetings of the main club. "The Montpelier Section's annual trail-clearing breakfast, Sally Sairs' famous sweet rolls, and how the two are "baked" together is the subject of this report. "As most GMC'ers in and around Montpelier know, Sally is the "primus motor" of this section. She is a former president and trustee, an avid hiker (End-to-End, of course), canoeist and camper. When life gets a bit too oppressive, she is likely to take off alone for a weekend on the Rangeley Lakes in Maine or a week in the White Mountains in New Hampshire. If she cannot leave home, she camps in the back yard, even if the snow is flying. When she is not doing something for the GMC (which is most of the time), she raises three fine teenagers, volunteers in the elementary school library, works as a nurse - her real vocation - and runs her own painting and wallpapering business. She also makes the world's best, sticky, gooey, sweet rolls. "As for the trail-clearing breakfast, it is served on a Sunday in June (June 13, this year) at 8 a.m. at the state picnic area near Smuggler's Notch. While orange juice, fried and scrambled eggs, coffee and milk are served, it is the unlimited supply of Sally's rolls that makes the breakfast an annual event. Members and guests come back year after year to build waterbars and saw out blow-dons, knowing that the menu will remain the same. "The recipe for Sally's rolls? I'm afraid it is a secret not for sharing, but it involves lots of brown sugar and nuts and whole wheat flour. If you want to make your trail-clearing day a success, you'll have to find your own gourmet cook with a different crowd-gathering recipe. "The Montpelier Section holds a Planning Meeting three times a year to draft a new Outing Schedule which is then stenciled shortly afterwards and mailed to all paying and prospective members. "The Planning Meetings (which are always listed as one of the last events on the previous schedule) are open to all who care to attend. In reality, very few but the most ardent hikers show up although all members are urged to participate. With calendars in hand, we sit down to schedule outings for every second Sunday and every weekend during the fall foliage season, and the goal is to fill the calendar for the next four months. We schedule work parties, hikes, bicycle, snowshoe, X-country ski, and canoe trips, some combined with overnight camping or cookouts. We usually stay in Vermont, but occasionally go to New Hampshire or the Adirondacks. "Destinations and leaders are chosen in the course of a general discussion, sometimes lengthy, where everybody has the opportunity to air his/her preferences which are then approved or vetoed. If the Planning Meeting is well attended, the schedule is filled relatively easily. If the attendance is poor, there are not enough ideas generated to make this basically democratic approach to planning work. "What we want to achieve with this short report, is a possible exchange of ideas with other sections. How do you schedule your hikes? How do you recruit new trip leaders to relieve the old ones? What ensures a good turnout where you are? Let us have a discussion about what makes a local GMC section work. "The Montpelier Section was found to be alive and well at its annual meeting on April 1 at Bethany Church. In fact, the turnout was most satisfactory considering the precarious (we almost said foolish) choice of date, about 30 adults and children in all. "The location and dinner was a departure from previous years' covered-dish supper at the Old Brick Church in East Montpelier. This time it was pot luck in the purest sense, and the meal was amazingly varied and well-balanced. And cheap. "Following dinner we conducted our annual business meeting. We elected new officers and talked briefly about our Sectional state of affairs. The membership count holds steady at about 40. We have enjoyed a healthy fiscal balance since we raised dues last year to $5.00 for adults. For our size we continue to offer an impressive variety of activities throughout the year, sometimes as often as once a week. We have seen several new faces lately and hope that some of them will stay with us. Like most Sections we find it difficult to attract younger members. "In addition to the routine maintenance of our part of the Long Trail and Sterling Pond Lodge, we cleared and blazed trails on both sides of Mount Hunger with expert advice from District Forester Conrad Motyka. We also built a waterbar for a private property owner on the East Montpelier side of the mountain. "After several whitewater canoe trips early this spring, May 1 was a change-of-pace day for 18 members and friends of the Montpelier Section. Shunning the higher, snow-covered and probably muddy trails, we hiked that section of the Appalachian Trail between Pomfret and Hartford, Vt. It was an easy ten-mile walk through rolling country scented with budding wild apple trees. The weather cooperated and spring flowers were on full display to the enjoyment of all, especially the camera buffs. Some of those identifying various species were Dot Babcock, Sally Sairs, Reidun Nuquist and Trip Leader Dave Morse. One new member, Gary Shangraw, was particularly helpful in spotting and describing various insects, all of which were very friendly and not the least bit hungry. Wildlife seen were some mice "underfoot" in a hollow log, snakes bathing in the sun, a hawk's nest and a pair of chickadees working diligently on a nest of their own. Various types of lichens and mosses were beautiful but some of us preferred the leeks we found, which were edible. The GMC board approved moving the GMC offices from Rutland to Montpelier on October 15, 1977; the move took place in December. The new offices are in the Chittenden Trust Company bank building on State Street. The corresponding change in the Articles of Association was approved at a special membership meeting on March 12. End-to-Ender number 1000 was recorded in 1977. The Nature Conservancy has purchased over 15 square miles of land near Stowe from Burt Forests, Inc.; the land will be added to the Mt. Mansfield and Putnam State Forests and Camel's Hump State Park. "A highlight of the Montpelier Section's summer was the long canoe and camping excursion to Labrador enjoyed by five of its members, Reidun and Andy Nuquist, Sally Sairs and Wendy and Bob Hamilton. The trip was well recorded on film and relived for other Section members who attended our fall slide show. "Among other annual events last fall was the Halloween Party held at Groton State Park campground instead of the usual site, Taylor Lodge, which was lost in a fire. The yearly Christmas get-together was held again at Duck Brook Shelter and drew in 14 people by way of cross-country skis and snowshoes - in 5º weather! More recently, some of us enjoyed a day of ski touring in the Spruce Mountain area of Plainfield with John Wires as host. Buchanan Lodge on the Bamforth Ridge Trail was destroyed by fire on April 17. The Lodge, built as Wiley Lodge in 1949, was renamed Buchanan Lodge in 1964. The New York Section and the main club decided that it should not be rebuilt at that site because it was too close to River Road. The Burlington Section announced plans to replace Taylor Lodge, which had burned down last September; the dedication of the new Taylor Lodge was on September 2, 1978. Montpelier Section member Roioli Schweiker's book on canoe camping in Vermont and New Hampshire (published by New Hampshire Publishing Company in 1977) was reviewed by Montpelier Section member Reidun Nuquist. "Membership in our Section is 50 for the past year, a number which sustains the average of the past five years. We continue to schedule around 40 outings a year of a wide variety, including canoeing, bicycling, cross-country skiing, snowshoeing and hiking. Two slide shows proved to be very popular, one about Iceland and the Nuquists' home and one about Labrador at the Hamiltons'. Our annual work party on the LT from Smuggler's Notch north to Chilcoot Pass attracted 14 and 14 also turned out to paint-blaze and clear the Mt. Hunger trails from the Waterbury and Middlesex sides. Unfortunately, the weather last year was uncooperative for several of the events. Average outings attendance remains around 12. At the GMC Annual Meeting, the Montpelier Section was recognized for Most Outstanding Service to the Main Club for its help in establishing the Club's new offices in Montpelier. Montpelier Section membership is reported as 32, a decline of 10 from the previous year. "This past summer has been an active one for many of our members. In addition to local hikes, some of our Section took their hiking shoes to faraway places. Gary Shangraw hiked and camped on mountain trails down under in Tasmania, Australia. Richard and Dorothy Babcock toured the highlands of Scotland. Andrew and Reidun Nuquist visited and hiked some of the islands of Norway. Doris Washburn returned to Switzerland for some real high-altitude trekking. Sally Sairs did the Mt. Katahdin-To-Monson, Maine section of the Appalachian Trail, thereby completing all of the AT north from the Massachusetts border. "A dozen Section members and guests attended the GMC Autumn Outing in Lincoln (see detailed report elsewhere). For those of us who hiked the Monroe Skyline, views of the early fall foliage were truly spectacular. The site was an exceptionally pleasant one and the informality if the gathering leads one to look forward to other Club get-togethers of this same type. Auction planned to supplement dues income and overcome budget deficit. The GMC receives 501(C)(3) status from the Internal Revenue Service; donations are now automatically tax deductible. The GMC budget will exceed $100,000 this year. "Membership in our section for the past year increased by one for a total of 45 adults and six juniors. Our best turnout for section events was a fund-raising auction with 25 present. Other well-attended outings were: overnight canoe camping trips, corn roast after hiking, slide shows of summer trips, and cross-country skiing followed by homemade chili. Average attendance remains around 11. Montpelier Section membership is reported as 29, a decline of 3 from the previous year. "The Montpelier Section began the spring season with a sunny, late-March hike over the packed snow of the Forestry and Dean Trails to Montclair Glen. There were fine views across the frozen beaver pond to a perfectly clear and almost snowless Camel's Hump. "As spring advanced, the Section enjoyed a mid-May wildflower hike in the Duck Brook - Jonesville area. This day of botanical identification and spring fever is fast becoming a Montpelier Section tradition. "In spring we always focus on our duties maintaining the Long Trail north from Smuggler's Notch to Chilcoot Pass. The hazy June morning began with a breakfast at the Smuggler's Notch picnic area. This repast was cooked by Sally Sairs and Bob Hamilton. Featured among the delectables were Sally's famous nut, whole-wheat coffee cakes. "Nine people turned out to eat and help with the trail work. It soon became apparent that we were too few and had too little time to work on all the problem areas of this heavily-used section of the Long Trail as well as work on Sterling Shelter, the Sterling Pond loop and the Elephant's Head Trail. Additional work days and the help of more Montpelier Section members will be needed to get some sections of the trails back into shape. "Julie Hand, our caretaker at Sterling, has been at work with her mattock and other tools on some of the steep, well-worn trail just above Smuggler's Notch. "Besides our trail work we plan a summer of hiking and canoeing in four states. August hikes will take in the Gothics and Lake George areas of the Adirondacks. "Canoeing has become a major focus of the Montpelier Section's summer activities. while not as numerous as hikes, canoe trips are among our section's most popular outings. Trips this year ran from April though October. "The first of July found us waking to the cries of loons on an island in Green River Reservoir north of Morrisville. Arriving early we secured the same tiny, birch covered islet as the previous year. The weekend was an enjoyable one of swimming and short canoe jaunts. "Later that month Montpelier GMCers canoed another section of Maine's Saco River. With almost all flat water but enough curves and isolation to make an interesting trip, the Saco is a fine river on which to learn canoeing. Its numerous sand bars, its shores lined with huge silver maple and its warm waters have made for delightful trips three years in a row. "In August, two of our members, Andy Nuquist and Sally Sairs, were on the wilderness lakes of western Labrador. Joined by Andy's brother-in-law from Norway, they had a truly international journey. Attention to map and compass were essential because wrong turns in the myriad of lakes that wind through the coniferous wilds of Labrador can well mean that the canoeist will not return. Our navigators had little difficulty and returned home having had fine weather and fair fishing.